I don't know the name of this tree but it produces these gorgeous seed pods which break open into these glorious red flowers, making this bare winter tree so beautiful. The bright blue behind it is the same sky we've had all week. The skies are so clear and cloudless, and on waking this morning I was able to stare out of the window and into a black sky with stars. Really such a nice way to start any day. These are gorgeous flowers. One house I lived in had one of these in the backyard. Masses of Rainbow Lorikeets used to come down to feast on them every morning (blessing or curse depending on how you look at it). I've always thought these were flames trees, but i've since seen pics of an Illawarra Flame Tree that looks different. 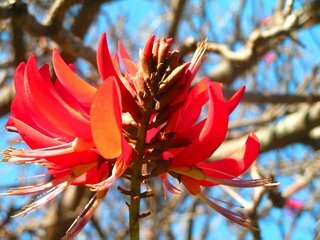 Two different types of Flame trees? Or am I mistaken? Not sure.